Revealing mistake: When the old couple who give Wolverine clothes are first driving towards their house, there is an aerial shot of them driving over a bridge. This is supposed to be set in Canada (drive on the right) but it was filmed in New Zealand (drive on the left). They are driving on the right but the arrow on the road is on the left side. 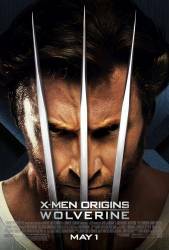 Revealing mistake: When Logan is at the old couples' house and checking out his new claws in the bathroom, watch where they come out of his hand carefully - the animation of his CG claws doesn't totally replicate the movement of his hands, making it look as though they are floating around his knuckles. Continuity mistake: In the scene where Kayla is dead and Logan walks to her, her mouth is open in one shot, but in the next shot when his hand is reaching for her eyes, her mouth is closed. Deliberate mistake: After Wolverine arrives at 3 Mile Island he approaches through a thick fog. Above him are a series of conveyor belts that are used at a coal power plant, not a nuclear plant such as 3 Mile Island. The belts are unique to coal mines and coal power plants, and would not be found at a nuclear power plant. The filmmakers obviously couldn't film on the site of a nuclear plant, so filmed on a coal plant to fill in. Continuity mistake: Wolverine fights the Blob in the boxing ring and knocks him out. When he interrogates the Blob on the whereabouts of 'the island' he draws his claws in a horizontal line, but when the shot switches back (beside Wolverine's shoulder), his claws are in a vertical line facing the Blob's face. The alignment of the claws switched from horizontal to vertical every time the shot changes. Continuity mistake: When we flashback to Kayla's fake death, the blood on her body is not in the same position as when the event really happens. Continuity mistake: In X-Men 2, when Wolverine re-enters the room where he had the adamantium grafted to his body, there are numerous claw marks on the walls and water bath which have obviously been made by him (3 marks, ie. his claws - Deathstrike would have made 4 or 5). In this film he just gets up and runs out of the room, doing nothing to justify where the claw marks come from. Other mistake: When Logan is talking to the old man in the barn, in the "This was my son's jacket, try it on" scene, he is sitting on the motorbike, and when he gets up, the bike doesn't move up on its suspension. A few seconds later, when he sits back down on the bike, the suspension sinks a lot due to the weight of his adamantium skeleton. Factual error: The movie takes place six years after the Vietnam War; mid to late 1970's (if the Three-Mile Island accident depicted in the film is supposed to be the actual accident, then it would be 1979; either way, it is sometime in the 1970's). The 20-dollar bills on the ground in New Orleans have Andrew Jackson's head in the large offset oval; a redesign of the currency that wasn't issued until 1998. Revealing mistake: When the team of Mutants are in the small village in Africa, it all goes kinda crazy and there is a bolt of lightning. If you look at the back left corner, you can see one of the flashes from a light they use to create the lightning flash. Continuity mistake: When Logan chops down the tree, its canopy is shown to be rounded, but when the tree hits the ground it has a different shape, noticeably more pointed at the top. Factual error: During the Vietnam War scene, Logan is seen equipped with what is supposedly an XM177 Carbine/Colt Commando. Unfortunately it's not that weapon, but an M4 which was issued in 1994. Continuity mistake: When Agent Zero starts shooting while in Africa, he throws his pistols into the air and the slides are open, but just before he catches them the slides are closed. Continuity mistake: In the scene where Wade (as the Mutant Weapon XI) & Logan's show down begins, Logan's claws release slowly, and in retaliation, Wade gets his Right hand's sword out. This is the front view. After Striker types in the command to "engage", the front view for Wade still shows only the right sword out. However, when the camera angle shifts to the left profile of Wade attacking, both the swords are out. Continuity mistake: When Wolverine first meets Gambit, he has a slight mustache and beard. Out in the alley, after his fight with Wolverine, his facial hair is much shorter. Stryker: Your country needs you! When Wolverine goes to the gym to talk to Fred, Fred gets insulted because he thinks Wolverine calls him a "blob" (Wolverine actually uses the word "bub", as he often does). In the comics Fred's character's name was the "Blob".